Lowther Homes is providing a lifeline for people looking to rent an affordable home – as new research shows working Scots are being priced out of the property market. Lowther, which has just welcomed tenants into its 46 new apartments in Yoker in Glasgow, is growing its portfolio of properties for mid-market rent, offering people on modest incomes the opportunity to live in top quality homes. It comes as research by the GMB union shows Scots earning average wages in 21 local authority areas can’t get a foot on the property ladder – sparking calls for more good quality, affordable rental properties. The development at Ellerslie path in Yoker is one of Lowther’s latest developments and has seen 46 stunning new one and two-bedroom apartments built in partnership with Cube Housing Association. The flats offer stunning views over the River Clyde as well as value for money. New tenants are benefitting from rents starting at £430 for a one-bedroom property and £510 for a two-bedroom property – as well as floor coverings, blinds and fully-fitted kitchens and bathrooms. Lowther, part of Wheatley Group, now offers 246 mid-market properties across the west of Scotland, with around 2,000 more planned to come on stream across the central belt in the next five years. Brian and Alan Cowan moved into their new two-bedroom apartment at Yoker after leaving a private let nearby. “We fell in love with this location as soon as we moved here but worried we were paying over the odds with our previous landlord. “We’ve always rented from private landlords, so moving to Lowther was a bit of a change but one we’re delighted with. “Buying wasn’t an option for us with the property market still so uncertain and while we can afford to rent privately, some rates are really expensive and the lets are often short-term. “I’m pleased Brian and Alan are feeling settled already. “We want to give people on more modest incomes a range of options for affordable, quality housing along with the peace of mind that may not come from a private let. 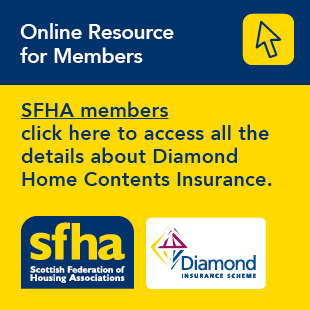 “Recent research shows working people are being priced out of the property market across Scotland. There are also frequent calls for more homes available for rent to meet growing demand. Lowther works with its partner organisations in Wheatley, such as Cube Housing Association and GHA, to deliver an unrivalled combination of services. As a developer, letting agent and property-management specialist, it provides round-the-clock customer care and a 24/7 repairs service through its Glasgow contact centre. The success of the new properties at Yoker comes swiftly after the first new tenants moving into Lowther’s other recently completed flats at the Silverbells development in Hamilton. Pictured: Lowther tenants Brian (left) and Alan Cowan were among the first to move into the new Ellerslie Path flats.